The dawn of the distro. The intellectual axes of distribution design. Linux distributions on “alternative” platforms. 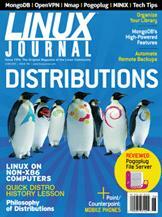 See how your favorite distro ranks with other LJ readers. It's not just a filesystem supported by Linux.